Vogelensang-Bloemendaal, Holland, 1937. The Fifth Jamboree. A census of 28,750 Scouts. B-P was eighty. The 9th International Scout Conference, B-P last. Scouts from 54 countries. Daily displays in the arena. Girl Guides use the arena to welcome Lady Baden-powell, World Chief Guide. The cleanest Jamboree yet: 120 showers and 650 water taps. 71 bridges over the canals that intersected the site. 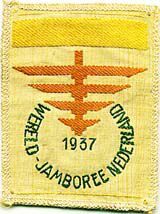 On presenting the Jamboree emblem, a Jacob Staff, B-P said: " Now the time has come for me to say good-bye, I want you to lead happy lives. You know that many of us will never meet again in this world..."